When it comes to power tools, drills are by far the most versatile and reliable machines that you can have at your disposal. However, what makes the device so amazing is that you can use different bits to work on various jobs. So, whether you need to drill through wood, plastic, or metal, you can find bits that will make the work go so much easier. With that in mind, today we are going to look at bits that will work best to go through metal. What’s important to remember, though, is that there are plenty of variations of metal out there, so it’s imperative that you find bits that are rated for the job. For example, if you want to drill through sheet metal, you can use almost any twist bit. If, however, you want to go through hardened steel, then you’ll need something a bit more robust. As such, we’ll be sure to discuss the different bit types and how they can be used effectively. 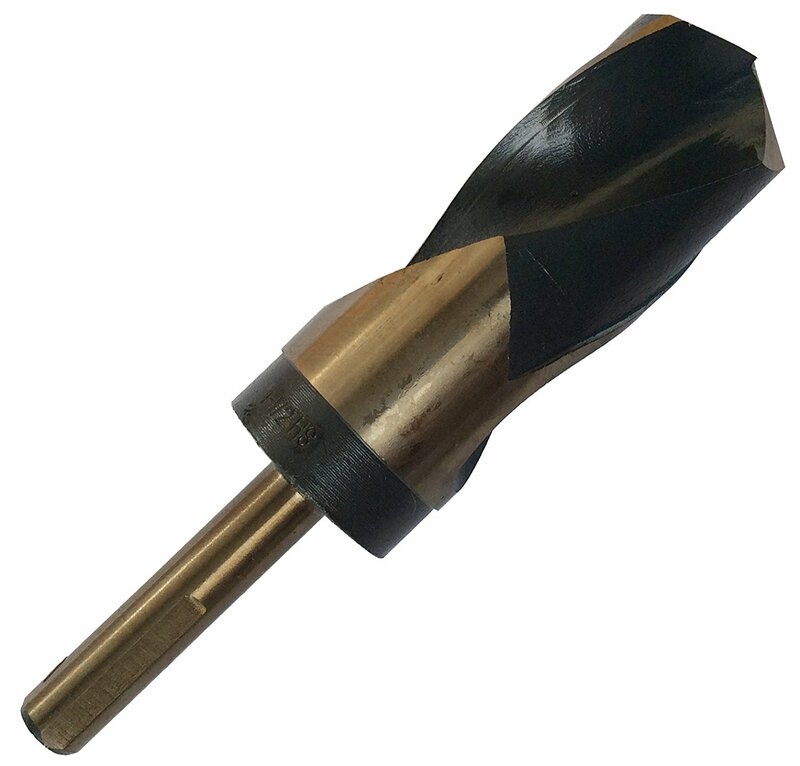 Kicking off our list is this high-speed steel bit from Drill America. As with most HSS bits, this one is designed to work with a variety of materials, including some lighter metals as well. What makes this particular bit work for the job is that it has a black and gold oxide coating and it has a split point tip. The coating helps to preserve the bit from overheating or getting damaged while working, and the tip ensures that it creates a smooth hole every time. As for the rest of the bit, it has a round shank, meaning that it will fit into almost any drill chuck. It is also three inches long and ½ inches wide, which is one of the largest sizes you can find. Finally, if you rotate the bit counterclockwise, you can remove the debris from the hole quickly and efficiently. As we mentioned above, if you want to get the most out of your drill bits when working with metal then you need to use ones that have cobalt mixed in. 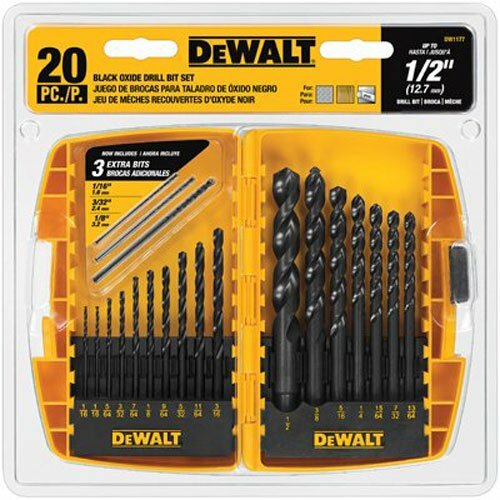 So, that means that this set of bits from DeWalt will outperform most HSS models since they have cobalt tips. This ensures that the bit doesn’t break down as quickly and will punch through most hard metals with ease. What we like about this set is that you get all of the standard sizes up to ½ inches, and each one comes with a gold oxide coating. This helps extend the life of the bits by reducing heat damage and breakage. Also, they come in a durable carrying case that lets you bring them along to any job site without risk of losing them. 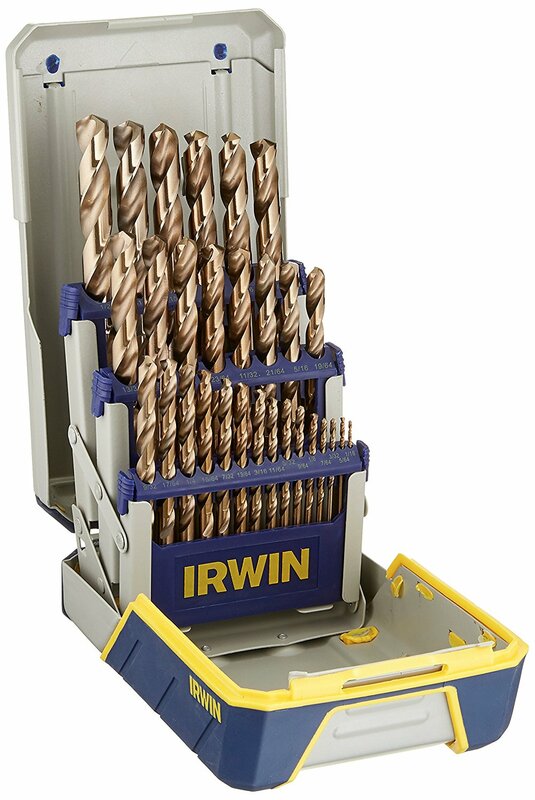 Next, we have another set of cobalt steel bits, and these are from Irwin Tools. Much like the DeWalt set above, these are made to withstand higher temperatures and more pressure, which means that you can work on harder metals without any problems. Best of all, they come with a gold oxide finish, and there are 29 different sizes from which to choose. We also love the carrying case that comes with these bits. They are arranged in cartridges that are clearly labeled so that you can pick out the right size for your needs. Also, the case itself is insulated to protect your bits in case you drop it. Finally, the cartridges are removable for extra convenience. While most of the bits that we are going to look at have excellent qualities for drilling through metal, many of them cannot withstand heavy duty use, such as drilling through hardened steel. However, this next set from Bosch is designed for high-end operations, meaning that you are getting some of the best bits overall. What makes these so unique and so powerful is that they are almost pure cobalt. While other bits are steel with a slight mixture of cobalt, these are the real deal. 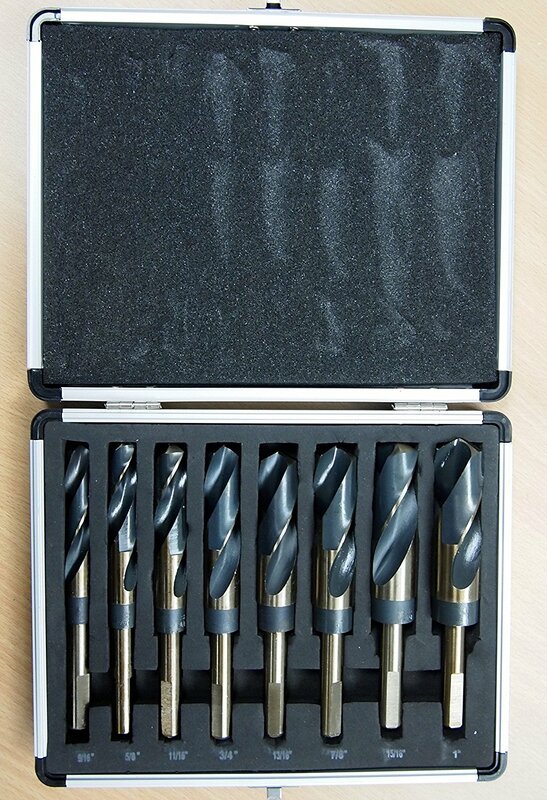 This means that you can drill through tougher, thicker material without risk of overheating or breakage. In fact, they are so durable that they don’t even need a black oxide finish. Overall, the only downside to this set is the carrying case, which can be a bit hard to open at times. Otherwise, these are probably the best bits you can find. Sometimes you don’t need to drill a deep hole, such as when you’re working with sheet metal. In those cases, a step bit might be your best bet. The reason that people love using these bits is that you get a variety of sizes with one piece of equipment. This means that you can drill holes of varying widths without needing to change the bit. As far as performance goes, this bit is ideal for thin metal as it is made of high-speed steel with a titanium coating. The coating prevents corrosion and wear and tear, and the bit also comes with a split point tip to help prevent walking. Finally, the shaft is three sided so that you get a better grip in the chuck and won’t have any problems with slipping. Next, we have yet another set of bits that use a mixture of steel and cobalt to deliver high-quality results. As such, these bits are built to handle stronger material such as stainless steel with ease. You get eight different sizes, although they are much larger than most of the other sets we’ve seen. That means that if you need to drill tiny holes, then you will need a more comprehensive set. 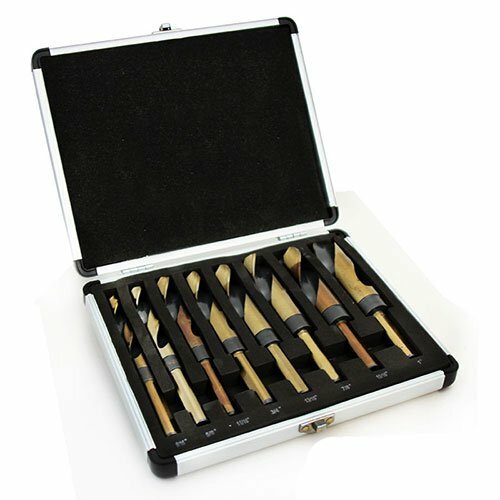 In addition to the durable material and the split point tips, what we also like about this set is the carrying case. It has a sturdy aluminum exterior with a soft interior. This ensures that your bits are in the best condition every time you use them. Best of all, the inside is clearly labeled so that you never have any problems figuring out what size you need. One thing that most bit sets have in common is that as you adjust the size of them, they tend to shrink. So, a ¼ inch bit is much smaller than a ½ inch one. That is not the case with these bits. Each one is six inches long, which makes bit changes so much easier. This way you don’t have to reset the chuck every time you want to resize the bit, which is a huge advantage. As far as performance goes, these bits are high-speed steel mixed with cobalt, so they can take on most metal jobs. They have split point tips to prevent walking, and they all come in a sleek aluminum carrying case. The only limitation of these bits is that they smallest they go is 9/16 of an inch, so you won’t be able to make holes smaller than that. Otherwise, they are excellent and reliable. 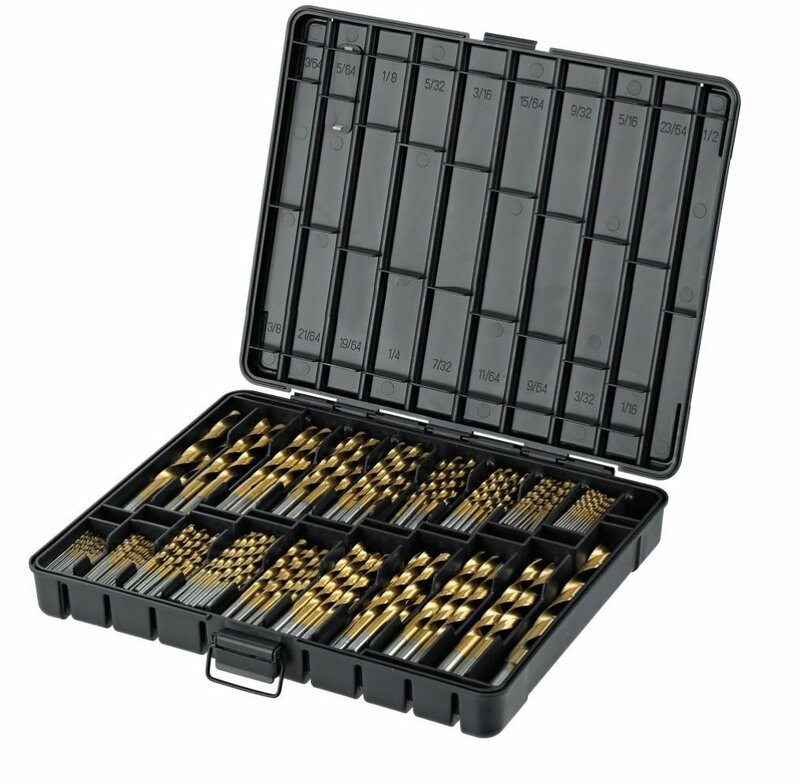 For the most part, drill bit sets give you a few different size options from which to choose. The downside, though, is that if one bit breaks you have to scour the hardware store to find a replacement, as it is more cost effective than getting a whole new set. In this instance, though, you get 230 bits with this set, meaning that you have more than enough spares for each size. The range for this set is only 1/16 to ½ inch, but you get a bunch of backups for most of them, making it a worthwhile set. The bits are made of high-speed steel with titanium coating, meaning that they are built for a wide range of jobs, including metal. Also, they come with split point tips, so they won’t walk as you’re trying to drill. Overall, if you do a lot of drilling, this is the set to buy. For the most part, when picking out step bits, you are going to choose them individually. 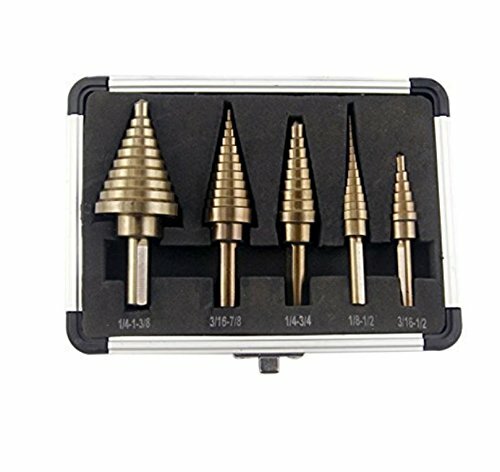 In this case, though, you get five different bits, which means that you get fifty various sizes. Also, each bit is shaped differently so that you can use them on varying materials with ease. Two of the bits are sharp so that they can create smaller holes in wood and plastic. The rest have wider split point tips so that they work well with metal. Overall, if you want a complete size range without having to buy a ton of bits, this is a great set to have. Not only are these bits versatile, but they are durable as well. They are made of a steel and cobalt mixture with titanium coating so that they last much longer and won’t break down very easily. They also come in an incredible carrying case with a soft interior. Best of all, each size range is clearly printed on the side of the bit so you can always know that you’re drilling the right hole. 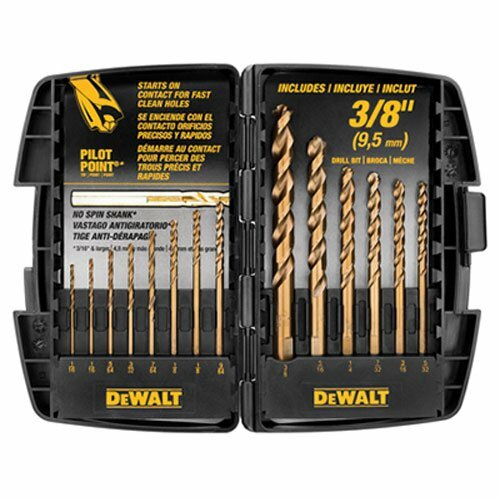 Our final set is another winner from DeWalt. Overall, if you’re looking for a cost-effective set of bits that can handle most light metals, this is the one to get. They are each made of high-speed steel with a black oxide finish, meaning that they are going to last for a long time. The other great thing about these bits is that they have a parabolic flute shape that removes debris while you work and delivers more accurate results. Also, they have a wide tip so that they don’t walk on the metal when you’re trying to drill. Finally, the carrying case is durable and reliable and won’t shatter if you drop it. If you want the best drill bits that can handle any metal with ease, then we highly suggest the Bosch CO21 set. The reason that these are better than the rest is that they are solid cobalt, which means that they are made to handle higher speed, temperatures, and pressures. Overall, you can do so much more with these bits than with any others on this list. That’s not to say that the others are bad, but that these are better made. 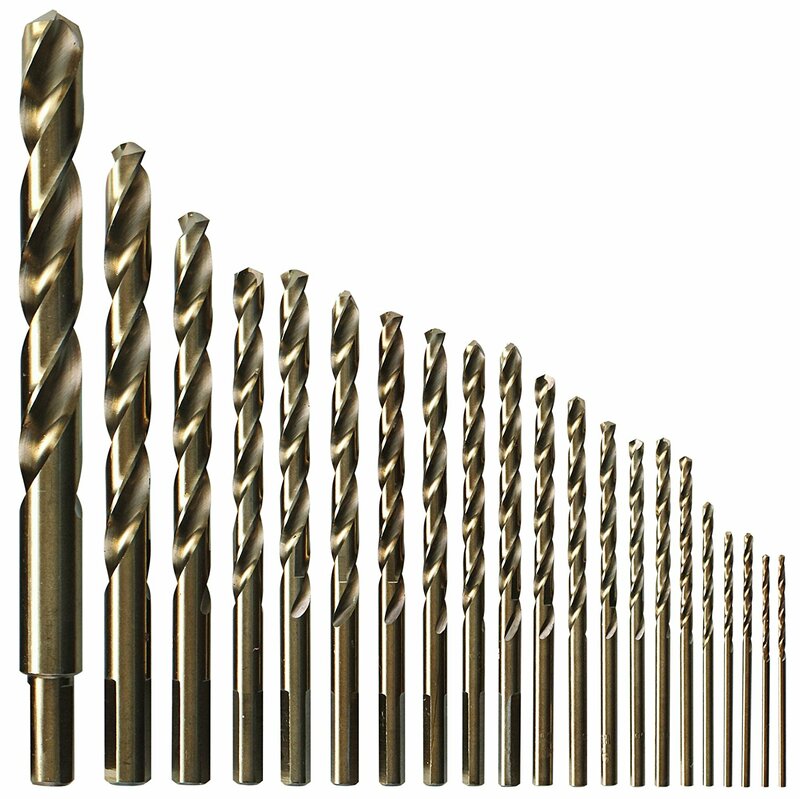 Overall, when picking out a drill bit, you want to make sure that it can handle the job you need it to do. When drilling through metal, you need something strong and durable that won’t break or wear down easily. Since metal on metal contact can create a lot of heat and friction, it’s crucial that you pick materials that won’t get affected by that as much. When it comes to working with metals, here are the most common drill bit materials you want to use. This is high-speed steel, and it is one of the more cost-effective options out there. Still, HSS is highly effective at putting holes through most metals, including hardened ones. What you want to look for, though, is bits that are covered in black or gold oxide, as this will keep them from getting too worn out from drilling through metal. If the HSS is bare, it will break down much faster. This material is ideal for harder metals as it won’t fracture as easily. Typically, cobalt bits are a mixture of HSS and cobalt, and it will say a percentage on the package (usually about 5-8%). We highly recommend these bits if you are working on stronger materials that need something with a bigger punch. For the most part, you won’t ever have to worry about carbide drill bits as they are only designed for the thickest and heaviest metals. Also, you need a special drill press to use them as they can fracture easily if you aren’t careful. 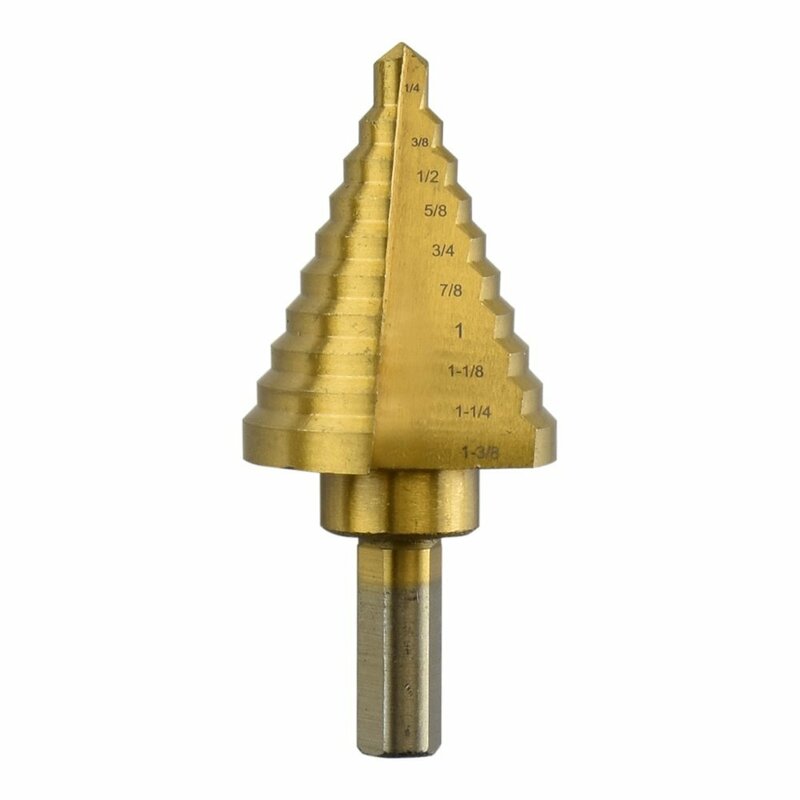 When you look at different drill bits, you will see that many of them come with one of two different angles on the tip. For softer materials like wood and plastic, you need a sharper point, which is usually 118 degrees. However, because metal puts up more resistance, you need a flatter tip that won’t walk as you try to drill. As such, you need to make sure that the tips are 135 degrees instead. For thinner pieces (such as sheet metal), you might be able to get away with an 118-degree tip, but we don’t recommend it. If you’re still new to the process of drilling holes into metal, then it’s imperative that you follow some basic procedures and guidelines to ensure that you get the best results possible. Also, it will help make sure that you don’t damage anything, including yourself. As such, you will want to follow these steps when making your holes. You should be doing this with any kind of drilling, but it’s particularly important with metal. If a shaving got into your eye, it could cause serious damage. Unless you are drilling into a fixed beam, hold the metal down with clamps so that it doesn’t move while you drill. Since it puts up more of a fight than wood or plastic, this is an important step. If you are drilling on a table or anything, then you want to put something behind the metal so that your drill doesn’t get damaged as it penetrates. It will also help keep you stabilized as you pull it back through. Thinner pieces will require you to put wood on either side so that you don’t risk tearing through the metal as you make your initial hole. With tougher metals, it can be hard to stay accurate when you’re first drilling. Many times the bit will start “walking,” which can pose a problem. To fix this issue, use a punch to make a dent in the metal first so that it won’t move around. Again, unless you are putting holes into a fixed beam or something, you will do a lot better to use a press instead of a handheld drill. This will ensure that you get a clean hole every time. Sometimes the metal will have burrs around the edges, which can be a minor problem. To smooth it out, use a larger bit and rotate it by hand. This should remove the burrs effectively. Since a lot of heat is generated when drilling through metal, you need to use the right kind of lubricant to ensure that it doesn’t damage either the bit or the piece on which you’re working. If necessary, lube while you go as well. If you operate your drill at the same speeds as you would with wood or plastic, it can wear down the bit remarkably fast. As a rule, the harder the material, the slower you should go. This will ensure that your pieces last much longer.